1 Hotel Brooklyn Bridge opened earlier this year in New York City and offers great views of its namesake. Ever get that sinking feeling of being a part of the problem: that is, part of a growing population that’s traveling more and more frequently? It’s a problem because, according to a recent UN World Tourism Organization study, vacationing already accounts for 5 percent of global carbon dioxide emissions. While the actual getting-there is the biggest offender, the UN agency responsible for the promotion of sustainable international tourism found that where you lay your head accounts for approximately 20 percent. To increase efforts to counter environmental harm, the UNWTO designated 2017 as the International Year of Sustainable Tourism. The next generation of environmentally friendly hotels brings encouraging news. Among those is 1 Hotels, whose nifty slogan, “Live Well and Live Green,” isn’t an empty mantra. 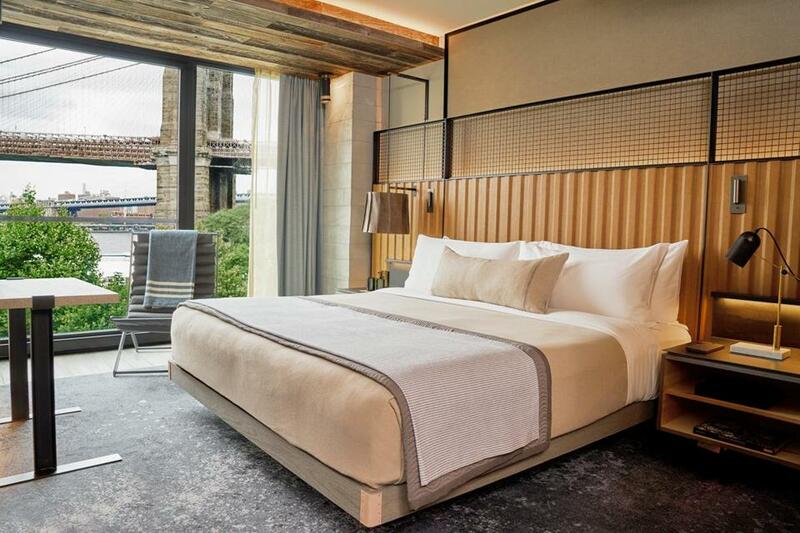 1 Hotel Brooklyn Bridge opened earlier this year in New York City, following locations in Miami and Manhattan. Located by Brooklyn Bridge Park, this hotel’s spectacular view of the famed bridge and Lower Manhattan is in itself enough to cause a booking frenzy, let alone the super cool, luxury touches. This place is nice. But 1 Hotels stuck to its word, making its first new-build hotel a showcase of eco-friendly standards. It’s the obvious eco-conscious elements that strike an immediate note: purified water flows free-of-charge from stylish stations in the rooms, eliminating plastic bottles; there are in-room recycling bins; and motion sensors shut off the HVAC system if you open your window to the Juliette balcony, and also turn off all power when you leave the room. Guests can see the hotel’s use of reclaimed wood in the corridors’ long benches and in the public spaces, it’s a historic touch that also decreases deforestation. Starwood Capital hopes these touches will gain the hotel a LEED gold certificate. Twenty-two percent of the products used in constructing the hotel — concrete, steel, gypsum board — come from recycled materials, and rebar and masonry was manufactured within 500 miles of the site. Guests can also interact with the hotel’s inner workings via a LEED Dynamic Plaque in the lobby. It measures and displays the building’s efficiency in real time. “It’s helpful to have the data, and the plaque is an emotional aspect people can connect with,” says Hadidy. Even the rain water reclamation system is visible to guests. And sometimes audible, too. “The lobby is a tall, interesting space, maybe 30 to 35 feet high with giant pipes running across and down, carrying the rainwater to Brooklyn Bridge Park to irrigate the trees and plants. You can hear the water inside the pipes during heavy rainstorms. It’s very cool,” Hadidy said. 1 Hotels isn’t alone. ITC Hotels’ Luxury Collection comprises 11 properties, all with a LEED Platinum certification (the highest standard), and five of them are 100 percent powered by wind power or solar power. Fairmont Hotels & Resorts joined the World Wildlife Fund’s Climate Savers Program after reducing its operational CO2 emissions by 20 percent below 2006 levels. And the exclusive Relais et Chateaux group has become a leader in supporting biodiversity — its Inn at Dos Brisas, just outside Houston, has its own 42-acre USDA-certified organic farm for the ultimate farm-to-table experience. “We have a sophisticated traveler who is very aware and conscious of the issues the world is facing,” says the company’s president, Philippe Gombert. “Our guests expect us to be the best and ask us to be leaders in sustainability. They may become upset if we don’t do our best. We have 500 individually owned properties, and we want to transform into a movement of sustainability,” Gombert adds. Linda Laban can be reached at soundz@me.com.